Can you remember ever feeling sorry about throwing an umbrella in a street trash can just because it was useless? There's nothing more frustrating than having your umbrella turned inside out and getting soaked up on the way to the closest shelter. Waiting for the rain to stop is not anyone's plan for the day! WindProof Frame is engineered with 10 steel ribs that are tri-folded for safety and strength. Premium fabric stretchers provide maximum canopy tautness and are made from an innovative combination of steel, fiberglass, and aluminum. Heavy Duty Steel Shaft provides superior rigidity and strength compared to aluminum or fiberglass shafts. Professionally Styled in classic colors, the umbrella is the perfect travel companion for men and women - equipped with a stylish euro-grip handle and tri-fold frame that makes it the ideal size to fit into your briefcase or travel bag. Click the Add to Cart button to Order your Traveler Umbrella! ☂Newdora 100% SATISFACTION GUARANTEE☂: We know that you'll love the Newdora umbrella. We offer you ONE year Warranty. If it doesn't meet your expectations in ANY way, we will promptly replace or refund you. We are confident of the quality of our umbrella. QUALITY MATERIALS: Instead of using cheap polyester like our competitors, Modohe umbrellas are crafted with superior pongee fabric which increases durability and strength. Modohe umbrella has a rubberized ergonomic design handle and an electroplated steel shaft made of fiberglass and aircraft grade aluminum materials. This is the only umbrella you will ever need. AUTOMATIC OPEN / CLOSE FUNCTIONALITY: Quickly open and collapse the canopy with the push of a button.You do not have to struggle with the opening your umbrella - with one hand, the Newdora umbrella springs open in a second. Folding of the canopy is only a button's push away as well. No more waiting for your umbrella to open or close while you get soaked by the rain! PORTABLE AND LIGHTWEIGHT - You don't have to choose between gigantic windproof umbrellas or tiny ones that cannot provide minimal wind protection. 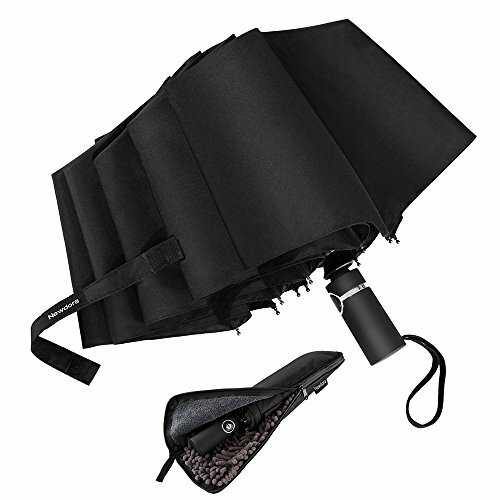 This excellent umbrella is the perfect combo of portability, protection and durability. The 210T specially coated water repellent fabric and slip resistant rubberized handle make it outperform other compact umbrellas. Foldable to 13 inches, it is small enough to slip in a coat pocket, tote or bag. If you have any questions about this product by Newdora, contact us by completing and submitting the form below. If you are looking for a specif part number, please include it with your message.